When I first started working on Judges Guild project with Bob Bledsaw around 2000 I kept calling the Wilderlands, the Majestic Wilderlands. Bob didn't know what I was talking about even tho I was 100% sure that was the overall name. Eventually under Necromancer it just became the Wilderlands of High Fantasy. Still I wondered for a long time why was I sure it was called the Majestic Wilderlands. Now I found my answer which is on page 17 of Pegasus #8. 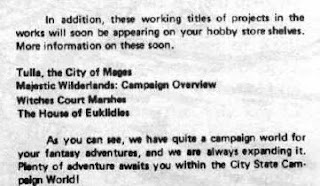 There is an article giving a overview of various Judges Guild Product and at the end there is a list of project they are working on. Now my question is answered. Still wouldn't made a difference as during the course of working with the Judges Guild I learned that a lot of the later Wilderlands products didn't reflect Bob's personal view of his Wilderlands. When the background and major details of the boxed set was organized it taken from his notes. After that was the contributions of the team and the later Wilderlands products was woven in. I normally ignore these but I like Brendan's set of question about what type of game you run. 3d6 six time arrange accordingly. Reroll a new set if you have two scrolls under 8 or no scores over 12. -3 times your levels until you reach your cap of negative constitution. Per spell, basically you are raised but weak for 1 week of in-game time. Roll them up normally and I will work them in. If the campaign has been going on for a while I will start them at a higher level randomized by a 3d6 roll. Individual. 1d6 + your dex bonus. Fighters get to add their to hit bonus. I manage it by using a count down. Monsters use group initiative except for important NPCs. On their turn players can do two actions, with a half-move considered a action and only one of the action can be an attack or a spell. Can always move 5 feet without drawing a free attack. So if you want to retreat without a free attack against you. You can take a 5 foot step and then a half move. Combat rounds are considered to be six seconds. Roll normal damage. If you roll a nat 20 you do a critical hit. Roll again to see if you score another natural 20. Stop rolling if you don't roll another 20. Each time you score a critical you get to add max damage to the damage you rolled. A natural 1 is a critical miss, roll a d6. 1-3 you throw your weapon away 1d3 x 5ft away in a random direction. Or fall prone if fighting unarmed. 4-5 you hit an ally, 6 you hit yourself. A adjusted roll of 17 or better that hits on a helmless target is a successful head short and cause the target to make a saving throw at +2 or fall unconcious. A adjusted roll of 20 or better is a faceshot and will cause the target to make a saving throw or fall unconcious unless they are wearing a greathelm. If you critically miss a result of 6 means you hit an ally. Magic Item components, and gold should be strictly checked. The rest within reason. You go up a level when you earn the XP. However magic-users will need to spend time time scribing new spells. 1 day per spell level, and 100 gp per spell level. Clerics will need to wait until their next rest period to pray for new spells. I have several custom classes that have require specific actions by the PC when they reach a certain level. I award monster xp plus a roleplaying bonus of a factor times the character level. The factor is usually set to 200 or 400. I will give additional rewards due the resolution of important character goals and penalizes out of game or metagame crap at the table (this happens rarely). You must describe what you are doing before making any rolls. Players are free to whatever they want. If they want to spend money and time getting retainers more power to them. However that means they have a group of individuals to deal with. As for morale I make a check when 50% of their allies are down, and another when 25% of their allies are down. For the first 1-3 they stay, 4 to 6 to they run, for the second, 1 to 2 they stay, 4 to 6 they run. If they are in a lair or home then they only run or surrender on a 6. Character basically roll a d20 plus their intelligence modifier if they roll a 15 or better they ID the magic item within one turn. If they want to spend a rest period doing the ID they automatically succeed. Magic users get a additional bonus due their Thaumatology ability which is any thing that has to do with the identification or understanding of magic. Magic Items are divided into three broad groups. Common, Uncommon, and Rare. Common magic items (potions, etc) can be easily bought at a magic store, Uncommon generally can be bought in very limited quantities, while Rare items are only avaliable on the auction circuit where access is controlled. Working on the exact prices but basically spend the time and gold pieces and the items is created. Not a issue but don't whine if you don't feel like you are partipating the whole time and you will have to learn to handle how to roleplay properly even when you have out of game knowledge about what the other half is up too. One of the few things I will blue bolt a player for is metagaming. Several things help me enjoy D&D more this round than back in the 80s. Getting the idea that running older D&D is more about making rulings than looking up rules. Having a over a decade of reenactment and boffer live-action rpg experience which helps me describe and referee combat better which is important considering how abstract D&D combat is. I simply improved as a referee and know more stuff to make interesting and memorable encounters. Because of the nature of the D&D rules, I do more of my thinking is on the details of the encounter rather than looking stuff up. The wealth of material to draw on when I am pressed for time is staggering. Having my house rules in a printed form, the Majestic Wilderlands, has been really helpful. Even you don't want to be a publisher I recommend using Lulu to print up your own collection. Or if you don't have a lot, use the local copy store to make a bound copy. The Greyhawk Grognard has an article about runecasters. My own solution involves 4e style rituals. I have a rule that to cast any spell that is a ritual you need components equal in value to the spell level squared time 10 gp. I have another rule that says that ritual take a minimum of a turn (10 minutes) to cast. Then I created magic using classes that can only cast spell using rituals. In order to cast spell in combat they need to create a scroll or in the case of runecaster runes. The advantage of Runes is that you can place them in a wider variety of locations. Make a rune staff, wand, dagger, etc. There also two types of runes. One shot runes which work just like scrolls. And permanent runes. Permanent Runes cost double whatever you have for scrolls. But afterwards can be recharged for HALF the cost of a scroll. To determine how many rune and object can have. I ruled each rune take up a space two inches by four inches. Basically divide the length by four and that how many runes that can be scribed. The advantage of this system is that you don't have to modify AD&D's spells. A fireball rune work just like a fireball spell. A fireball ritual works the same as well but you would have to be in a siege, behind the battle line, or a special combat circumstance to pull off the ten minute casting time. I would rule that the time to activate the room is the same as the equivalent scroll. In my campaign magic user can cast ritual equal to 1/2 the highest level spell they can cast rounded down. So when you can cast 2nd level spells you can cast 1st level ritual. But this is optional. You can have ritual caster as a separate class and not have magic-user being able to use rituals. The effect of this on game is that the player loads up on runes to the limit he can carry. They have more "firepower" but once expended they have no quick way of regaining spell power. Since scroll/rune making take days and weeks of in-game time it is an important consideration as to when runes are used. I flesh this out in further detail in my Majestic Wilderlands supplement. When I published Majestic Wilderlands, I vowed to eat my own dogfood and ran several campaigns using Swords & Wizardry plus Majestic Wilderlands. Nearly three years later one campaign was completed and one is still ongoing. When I started I posted some notes on how I planned to run Swords & Wizardry combat. Here how it shook out after two years of use. 1) Everybody rolls individual initiative every round adding their Dexterity Modifier. Still use this, but now Fighters get to add their to hit bonus. The initiative die is 1d6. I switched from a initiative board to a countdown system. I first ask if anybody rolled higher than a ten. That determines the number I start counting down from. Then I go ten, nine, eight, etc. This developed from having 7 to 8 players at my table during the Gold Star Anime games. 2) You can move up to 1/2 of your movement and get your full range of attacks. I still do this. Works well nothing more to comment, other than a bunch of stuff like drinking a potion, dragging something out of the backpack count as a 1/2 round action. Basically a character can do two things a round. 3) If you get multiple attacks in melee you get one attack during your initiative and the rest at the end of the round. Quickly fell by the wayside as too fiddly. 4) You can 1/2 move and attack, and attack and 1/2 move. You get to step one square before each attack and take one 1/2 move anytime keeping with the "You can do two things in a round" rule. 6) multiple ranged attack all go off on your initiative. 7) you can choose to move up to 1/2 move and split multiple ranged attack at any point on the move. Never came up in two years. Although if somebody wanted to do this I would let him. 8) There is not attacks of opportunity or free attacks you can roam the battlefield how you feel like it. 9) The only exception is that you must stop movement when entering a hexes or squares next to a enemy. If you are already next to an enemy you can always take a step of a single hex or square before attacking. This includes multiple attacks. Still do this. Basically you can take a step as one of your actions and not have anybody free attack you. Anything else draw a free attack. The procedure for retreating is to step back a step and then do a 1/2 move. 10) Spells goes at the caster's initiative. If the caster takes damage before their initiative then they can't cast a spell. Still in enforce although it rare when somebody is knocked prone. 12) 1 results in a miss and you throwing your weapon into a really inconvenient spot. I use a d6 roll for critical miss. 1-3 fumble your weapon away/fall prone, 4-5, hit an ally, 6 hit yourself. 13) a 20 results in a critical hit that is your normal damage + max damage. You can keep rolling and for every 20 you roll you get to add max damage again. For example if Able rolls three 20s in a roll with a longsword and a +1 str modifer then he would do 9+9+9+1d8+1 damage.Works great and still use it. After reading a very similar rule in another game, I may modify the roll so that if you score a second success you get to do some type of extra game. 14) See the Majestic Wilderlands for various rules on weapons like polearms, crossbows, shields, and mounted combat. Still used but doesn't come into play often. 15) attacks from the rear are +2 to hit or flanking a target will grant a +1 to hit to both flankers. It all +2 to hit bonus. Thought you find this useful to see how house rule play out over time. GURPS Conan has been released in PDF form! This was a outstanding supplement for GURPS and includes a well-written and concise overview of Conan and his world. They are planning to release the four Conan adventure that SJ Games produced. Interestedly they are designed as solo adventures. The first one "Beyond Thunder River" was fun to play and there was quite a bit to do. 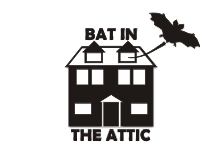 Monte Cook has a new article are on Unifying the Editions. Of interest to me is this comment. In effect, what you end up with is a fully playable game with its own style. Think of it this way: It would be wrong to say that there is no inherent D&D style that carries across the nearly forty-year lifespan of the game. What you really end up with, in this approach, is a game that ends up looking—not coincidentally—like original D&D. Not entirely, of course, and not precisely, but close. It's a game that captures the feel of OD&D. Of course this not exactly new news as the authors of the various retro-clones like OSRIC, Swords & Wizardry, or Labyrinth Lord can tell you. But it heartening to see that the core version of D&D Next may wind up something that looks like one of the OSR retro-clones. That would mean an expanded audience for everybody in the OSR as it would be way easier to leap into playing a older edition from those rules than it would be if all you experienced was D&D 4th edition. And even if D&D Next didn't wind up looking like a OSR retro clone, the attention to old style D&D gaming will prove beneficial to the OSR in the long run. I will report any details as soon as it is allowed. Knowing what is in the book. At Dungeon Fantastic and Gothridge Manor Peter and Tim talk about on player knowledge of monsters. Generally I am not concerned about it, run a specific RPG, and/or campaign multiple times your players will know the mechanical details of creatures, items, and campaign secrets. So how to keep it fresh? Many would advise to change things up with the creature itself. Maybe this Medusa doesn't turn people to stone but instead charms them in order to kiss them while the snakes in her hair feeds on the unfortunate PC. Done right this can led to a memorable adventure and a highlight of the campaign. But done too often it can get tedious as the referee comes off capricious and arbitrary. Make new creatures? Same issue, it can be memorable once a while but done too often your campaign feel like the menagerie of the weird. Because I chose to stick with one setting, the Majestic Wilderlands, for my fantasy campaign I was confronted with this problem early on. It ceased to be an issue for me when I realized that you can think of the Wilderlands as a living breathing world. Walk the street of any town on a busy day you will see a dozen or more people around you. Each with a unique story and motivations, all human. The same variety is seen when biologists track animals in the wild. There is no reason why orcs, elves, dragons, monsters can't have the same variety. Of course we are not Commander Data capable of simulating the life of planet with digital timing. So the referee have to be creative in how introduce variety. For a specific creature or fantasy race, you think of the broad possibilities. While people and creature are individual, when looked at in aggregate the average is shaped by environment, and history. There are always outliers but individuals tend to somewhere fall in a broad range. So the first thing is to figure out what is that broad range for a fantasy race or creature. Then think of the variations within that range. About a half dozen should do. You will find in coming up with that list you will see connection and possibilities not only for a adventure but a multitude adventures. Plus you will add to your bag of stuff so that when the players decide to go left into Orc Forest instead of right into the Mountains of the Moon, you can quickly throw together an Orc Adventure. Start you off try to think of how orcs would actually be if they lived in your setting. Live, eat, make stuff, play, love and yes make war. Then move on to the monsters and race that dominate your campaign. Remember you don't need a lot of detail, If you end up with a page of notes you done enough as long it provides the spark for future adventures. This technique uses roleplaying to overcome the limitations of game mechanics. In this case knowing what the creatures stats are. 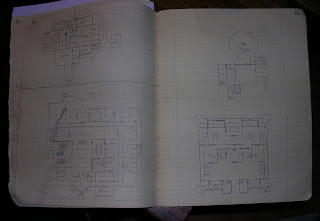 The best cool tool for creating dungeons is a really big sheet of graph paper. The only problem is that it is too cool. You want to save it for the extra special dungeon that never seems to get done. But back in the 80s I found another one just as cool and more importantly it get used. 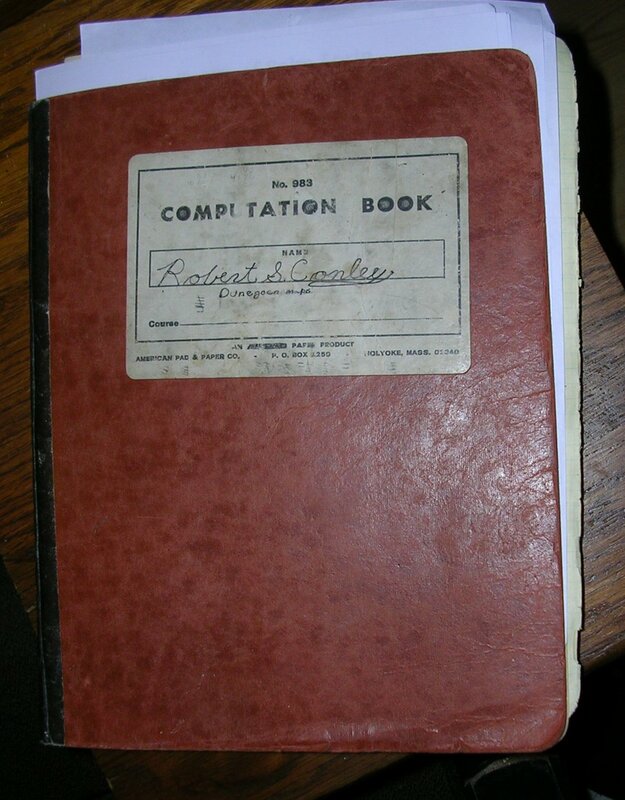 The Computation Book. 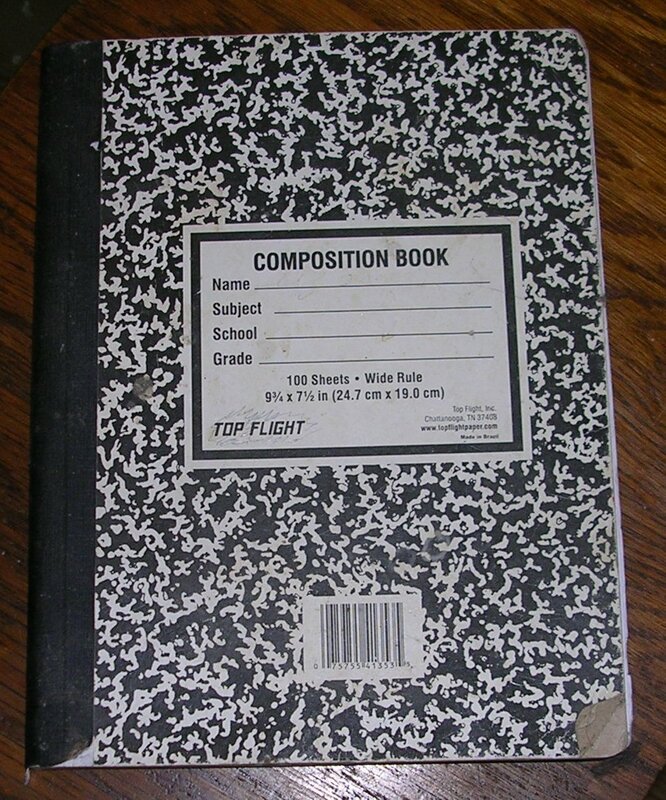 A Composition Book. 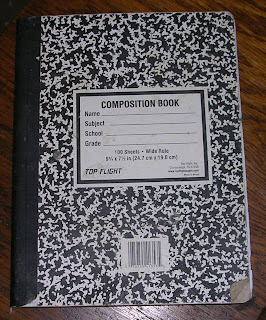 While composition books are great I am talking about this. A Computation is a bound book of extra large sheets of graph paper. Typically about 75 or so sheets per book with stiff cardboard cover. They are typically used to record the results of experiment and as I found out when I was a freshmen in college they make a great place to draw up dungeons, multiple dungeons!. 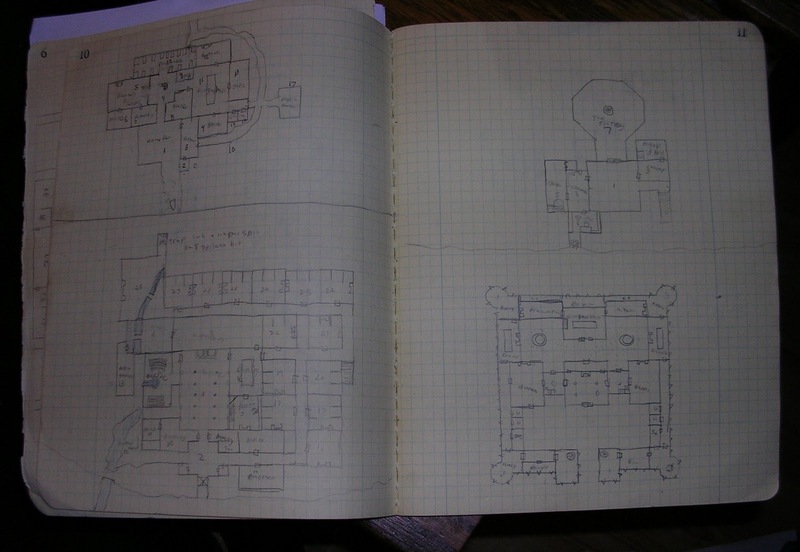 The above photo two of the two dozen or so dungeons I have drawn in this book. This Computation Book is pretty much the only dungeons that manage to survive the various moves I made. The loose leaf ones are all pretty much gone. Unfortunately I did not record the full keys, luckily I penciled in room descriptions as you see above if you zoom in. The nice thing about Computation books is that you can use the next page for the key if you want. The page numbering makes it easy to make a index to keep track what dungeons are on each page. For my Swords & Wizardry campaign up at Gold Star Anime I been having a lot of fun coming up with new adventure using these old maps. Although I am sure the three characters that got turned to stone last Wednesday wouldn't agree. Computation Books are still being widely used and can found at various office supply stores on the internet or in your town. They are inexpensive, Amazon has one here for little under 12 dollars. Even after 20 years of having this book, only half of the pages are full so you get a lot of use out of it.